Four war-veterans, former enemies journey back to past battlefields deep within the African interior in search of reconciliation, forgiveness and … atonement? The characters in our film, MY HEART OF DARKNESS, are men who have nightmares of war. Forcefully recruited into the military at an early age, often to fight against their own countrymen. Four men, four stories entwined, four fucked-up lives. Always ready to crack, to strike out even against those they love? Why do they snap awake in the middle of the night, running, sweating, pursued, terrified? MY HEART OF DARKNESS, a journey of reconciliation into the dark African jungle, into a psyche so tainted with years of colonisation, religious brainwash, superstition and witchcraft, where history seems unnoticed, mistakes repeated over and over again, where lies are true until discovered, where life’s worth as much as a bullet, a journey that took us into the darkest of our own souls. It is undeniably a story that becomes frightening and cruel the farther we churned up that river. Nevertheless, deep down there is a flicker of hope, of human hope that tells of a will to change and the painful insight that shows the contrast of cruelty and selfishness… to dare to love your enemy. As story infinite and universal, that all can relate to, even if you haven’t been in a war yourself. As more young boys return from Afghanistan to peaceful Sweden wrapped up in body bags, one often wanders what it take to quench the warmonger’s of this world’s thirst for blood, how many bodies will it take to still their hunger for death and destruction… and what will it take to cleanse all that? During the nearly four years of working on the film, following the veterans journey up the river, closer and closer to their own hearts of darkness, we too had to delve deeper and deeper into our very own souls, our owns doubts but we had to go there to fully understand this process, to participate in that final blood cleansing ceremony. It was inspiring to watch our characters change and transform from former enemies to friends, and made us realise that veterans the world over, have many similarities and much to share and learn from each other. Deep down there the roots are at work, very often, with no one to encourage them. They are true role models, risking proving to themselves and also to us, that reconciliation is possible and that war is fucked up, and that most people just want to live a peaceful life. By screening this film in relation to the exhibition I Will Never Talk About the War Again containing works by artists from former Yugoslavia, also from a society marked by traumatic war memories, Färgfabriken wants to highlight the individual's role and situation in the perverse logic of conflict. MY HEART OF DARKNESS blog. Here we will keep you updated on news and happening around our film, festival activities, results and more. If you are for reconciliation and peace in this world ridden with conflict and war, here is space to share your views. Please inform all your friends and others interested. We would like to hear from you and share your views. Alone we nothing. * PAN AFRICAN FILM FESTIVAL PAFF, Los Angeles 9-20 Feb. 2012. In Competition (Directors & DoP present). * 7th FREE ZONE FILM FESTIVAL, Belgrade, Serbia, November 4-9th 2011. * FÄRGFABRIKEN 2011"I Will Never Talk About the War Again Psychosis part 1" 16 October 16:00. "I Will Never Talk About the War Again Psychosis part 1" relates the condition of society with personal experience. Presented artists are related to the Balkans and deal with testimonies of trauma or collective psychosis of the traumatic post-war society, yet try to avoid stereotypes or to exoticize. 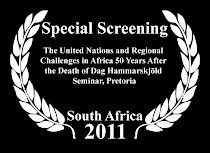 * The United Nations and Regional Challenges in Africa 50 Years After the Death of Dag Hammarskjöld Seminar. 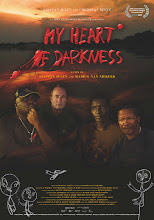 "My Heart of Darkness" screening opens the Seminar at the University of Pretoria, 13 to 15 July 2011. Organised jointly by the Department of Political Sciences/University of Pretoria and The Dag Hammarskjöld Foundation/Uppsala in cooperation with the Embassy of Sweden/Pretoria. * NATIONAL ARTS FESTIVAL GRAHAMSTOWN 2011, South Africa July 7-8, My Heart of Darkness in special session around the issues of post border war legacy. Screening & discussion of My Heart of Darkness 16th April 17.00. From Friday 13 start of the EDOC functions in Quito in Ochoymedio, incineration, Sala Alfredo Pareja of the CCE and the Junior World. This first weekend will be 56 roles in 6 rooms, forums as well as national and international directors. * Swedish Cinema Premier 8th April 18.00 Bio Zita 2011. * Winner Best Documentary Award FIC Luanda International Film Festival 2011. * Nomination best Feature-length documentary, Tempo Film Festival Stockholm 08th-13th March 2011. 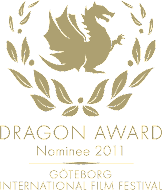 * Dragon Award nomination best Swedish feature-length Documentary Film, 34th Göteborg International Film Festival 28 Jan-07 Feb 2011. * IDFA in competition, nomination best feature-length Documentary, International Documentary Film Festival Amsterdam 17th-28th Nov 2010.